for the victims of the October 1st deadly bombings. Mid October figures indicate the foreign arrivals at Bali's airport are 50% down on October last year. Japan Airlines have announced that they will consolidate the daily Bali and Jakarta flights into one flight. Other airlines are following. Air Paradise are cancelling some flights out of Australia and transferring booked passengers to other flights. Check before you fly. calculated, the general consensus in the marketplace is that the business downturn this time may prove less severe and of shorter duration than experienced following the 2002, bombing. Many hotels and restaurants have started to lay off staff due to the post bomb downturn in arrivals. Several hotels have put staff on a 2 week on - 2 week off cycle. Bali: Five Bali bombers - were moved from Bali to a more secure prison in Java, amid growing demands from the Balinese for their immediate execution. A huge protest was held outside the Kerobokan Jail on Wed Oct. 12. Over 1000 people attended including Pak Made and the staff of Warung Sobat. Bali Oct 21: The Indonesian government has shut down an Australian TV drama series about the 2002 Bali bombings, after the government had revoked their permit due to political sensitivities. Due to the recent fuel price rise, most commodities have risen in price in Bali. Taxi fares, bus fares are all up. Food prices have increased as most foodstuffs are imported from Java. This is an extra burden on workers who have not received an increase and now many faced with loosing their job. Few tourists realize that the staff in their luxury hotel only receive a wage of around A$80 per month. Waiters get less and rely on tips to feed their families. The average 126.6% fuel price hike last month has turned out very costly for the country's economy, with an official report showing inflation rising to a six-year high at 17.89% and unemployment also raised. Oner 10% are unemployed. Surging inflation has also prompted the central bank to increase its interest rate to 12.25%, which could hurt consumption and businesses alike. From a political perspective, the worsening economic situation will certainly put the government's economic team under pressure prior to a possible Cabinet reshuffle. flew to Jakarta with ADAM Air, then to Bandung by train. The air fare was only slightly more than the 24 hour bus. Jamal said Adam Air were great and he will use again. Jamal will spend a week with his family in Ranca Ekek an outlying suburb of Bandung. The ministry of transport has estimated that some 16.9 M people journeyed across the country this year to see loved ones in the run-up to Idul Fitri. Indonesia is the world's largest Muslim populated state, with over 80% of its 220 Mill. citizens following Islam. holiday at the KHO. Simon said "No way he would cancel because of the latest bomb attack." During his stay he visited Padang Bai, travelled by ship to Lombok, visiting Kuta Lombok, Suranadi, Gili Trawangan Mataram and Ampenan. In Bali he joined us on a weekend in Bedugul where we visited Rob & Win's "Misty Mountain" Hill Station, Italian coffee plantation. Later we went on to Lovina Beach. until Jan. 29. Sydney's three flights a week will be maintained alongside the twice-weekly Qantas service between Darwin and Denpasar. Bali: Air Paradise have drastically cut their schedule to Melbourne after the latest Bali Bomb. They have reduced their fleet from 4 Airbus aircraft to 2,. there are now only 3 flights a week to Melbourne and from Denpasar 2 per week. The only direct flight to Denpasar is on Saturday and the only direct return flight is on Tuesdays. Fri Oct 21: An earthquake measuring 5.3 on the Richter scale jolted Indonesia's Sumbawa island early Friday at 7:15 am. There were no reports of casualties or damage. The epicentre 140 km south of the island and 300 km S.E. of the KHO. coast of Aceh triggered a tsunamis that left at least 217,000 people dead around the Indian Ocean, including 131,000 in Aceh. The view of the lights along a runway in Terminal I of the Soekarno-Hatta International Airport, Jakarta, with dozens of the lights missing, presumed stolen. As of Thursday, the police and the airport authority had not yet found the culprit(s) in the case of the stolen runway lights. Bali Oct. 12 4 pm: More than 1000 people assembled at the Bajra Sandhi Monument in Denpasar to remember those who died in the Bali Bomb attack 3 years ago. Jamal is now right into water colour pencil drawings, last weekend he was at Lake Bratan in central Bali capturing the vista's. Jamal exclusively uses Faber-Castle pencils. Originally from Germany, Faber-Castle pencils are now manufactured locally in Jakarta. The factory was opened in 1990. The Faber-Castle pencil company was established by cabinet-maker Kaspar Faber (b. 1730, d. 1784 ) produced his own pencils in Stein and sold them in the market at Nuremberg from 1761. A Gala Champagne party was held at Warung Sobat on Oct. 20 to welcome Jamal home from his art retreat and to launch his new pencil drawing collection. George and cousin Simon flew in from Australia and friend Luke arrived from Lombok. Jamal presented three of his works to friends. No doubt collectors items in years to come. Ines - the first lucky recipient. For many years Jamal has painted in oils, however when John's mother, Nancy was in Bali last August, she suggested Jamal try colour pencil drawing - presenting Jamal with a huge box of Faber Castle gourmet sharpened pencils. 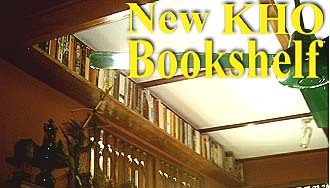 The Kho Library Bookcase is full so time to find some more space. No floor space for a new bookcase. What to do, we called a meeting of the KHO engineering staff who decided after 1 bottle of scotch, why not build a shelf in the ceiling. Secure, decorative and practical. linear in size. We headed of to the timber yard and after going through a dozen or so planks we finally found one that was ok.
was varnished and mounted into the lounge ceiling. (Right) Dede cleans up the mess. Last week we took the KHO jeep to the Police to re-register it. In Indonesia you pay every year and receive a receipt which you must carry with the registration when driving. No window stickers here. However every 5 years you must get new number plates, which are dated with the year of expiry. So we had to take the jeep in for a engine & chassis number check. Friend Anwa handled the organization of the whole process, which took 3 days. In Indonesia there is no third party insurance. KHO Bali: The KHO front fence now has an additional 900 mm metal fence addition. of Denpasar and delivered to the KHO for rapid installation. Soon holes were bored, cement was mixed & the job was finished. Indonesia's Minister of Transport, M. Hatta Rajasa has confirmed that the Government will ban the use of Boeing 737-200 aircraft and also revise its rules on the maximum age of passenger aircraft to 35 years or 70,000 landing and take-off cycles. Under the new rules four B737-200 aircraft and one Fokker 28 MK 400 must be withdrawn from service before Dec 7, 2005. Currently in Indonesia's domestic fleet there are 198 aircraft, 4 are between 30-35 years old, and another 44 planes that are aged between 25-29 years. A Boeing executive recently recommended the phasing out of B-737-200 aircraft because the older planes were no longer economically efficient to operate. when the 737 program was initiated in 1964, as both of these rivals were already into their flight certification programmes. To speed up the development time, Boeing reused as much technology from the existing 707 and 727 as possible, most notably the fuselage. This gave the 737 a critical advantage over the opposition - six abreast seating compared to the 1-11 and DC-9's five abreast layout, and also made the 737 cheaper and quicker to design. The 100 and 200 series are easily identifiable by their small tubular engine nacelles. These were early jet engines of a low by-pass ration, later models used fuel efficient, quieter higher by-pass engines. 1,250 are airborne at any time. One takes off somewhere in the world every 5 secs. 737's have carried around 12Bill. passengers. The 737-200 made its maiden flight on Aug 8, 1967. The 737-200 was produced until 1988. The launch customer of the 737-200 was United Airlines. By the 1990s, the 737 had lost ground technologically to the newer Airbus A320. In 1993, Boeing initiated the 737-X or Next Generation (NG) program which amounted to what was a complete redesign of the 30-year old airliner. Over 5,000 Boeing 737's are in service throughout the world. The first models used the Boeing 707 interior with the Passenger Service Modules containing, passenger air control, reading light and oxygen mask and speaker. In the early 1970's the new Advanced 737 was introduced with a new interior and overhead baggage lockers. 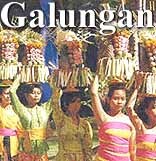 Bali October 5 & 6: The Balinese people celebrated the religious holiday of Galungan. The Galungan festival marks the victory of dharma (order/good) over adharma (disorder/evil). Ironic only days after the second Bali Bomb attack. pestilence and famine raged across the island. The crops withered, rivers turned dry and people grew sick. Indra, god of storms and war, heard the island's prayers and came to earth with a great army to destroy Mayadenawa. Following the terrible battles, the evil king was killed in the hills of Gianyar. He died on Rebo (Wednesday) of the 11th week of Pawukon calendar. 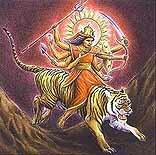 Mayadenawa symbolizes the adharma and the day of his killing marks the victory of dharma over adharma. The Balinese Hindus express this victory with prayers, the feast, offerings and also the get-togetherness. As any Balinese will tell you, good must ultimately triumph over evil. 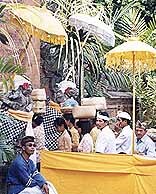 Ten days after Galungan, this year on Oct 15, the Balinese undergo another important day of religious observance. The day when ancestral spirits make an annual visit to this earthly plane for a ten day period leading up to the last holy day of Kuningan. In preparation, ancestral temples are cleaned, special offerings are made, and dances presented to humour the hearts and bring contentment to those members of the family, now deceased, back for a reunion with family and friends. Microwaved water and other! liquids do not always bubble when they reach the boiling point. They can actually get superheated and not bubble at all. The superheated liquid will bubble up out of the cup when it is moved or when something like a spoon or tea bag is put into it. To prevent this from happening and causing injury, do not heat any liquid for more than two minutes per cup. After heating, let the cup stand in the microwave for thirty seconds before moving it or adding anything into it. Coffee is added to the superheated water. Immediately the coffee enters the cup the water gushes over. Next time you want a cup of coffee, play safe and put the kettle on. stick back, they get smaller. 8. A 'good' landing is one you can walk away from. 11. The probability of survival is inversely proportional to the angle of arrival. mountains have been known to hide out in clouds. 15. There are three simple rules for making a smooth landing. Sadly no one knows what these are. 20. Good judgement comes from experience. Sadly, the experience usually comes from bad judgement. Ramadan. I think I will go to Cambodia early next month. Best regards, Mark. Vietnam: We return to Bali about the 6th nov. best wishes to jamarl and enjoy now cheers Geoff. Paynesville: Hi John, Can't get through on phone at this stage, presume you are well away from the bombings. train from Czech Republic, Poland, Lithuania and then Russia. Spent almost 3 weeks in Germany, visiting friends, then 10 days dragon boating in Berlin on Team Canada, the Aussies weren't there, I was on the senior team, meaning we were all over 50, we beat the Americans in every race. Holland for a couple of weeks. In England, I did some travelling too. ust returned from nearly 2 weeks in Tunisia. Tomorrow I leave for a short trip to Romania, check out Dracula's castle, then Basel. Switzerland, a few days in the midlands, seeing friends in York and Newcastle, then it's 4 weeks in India and 2 in Nepal. Back in Vancouver Dec. 22, just in time for Christmas. Take care & thanks for the updates, love Sheila. construct, later lines were built in the 3' 6" gauge. The first of the narrow gauge lines opened 1873 and connected Jakarta and Bogor. 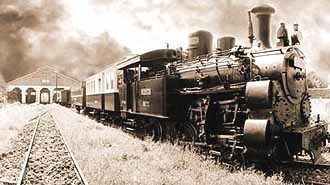 In 1878 the first line of the State Railway was opened between Surabaya and Pasuruan. Three years later, construction was begun on a line from Bogor to Cicurug in West Java, with the intention to reach Cilacap, an important port in the southern coast of Java. In 1884, the SS lines from the east reached Surakarta, on the NIS main line, and in 1888, the western line reached Cilacap. A continuous railway line was in place between Jakarta and Surabaya in 1894, with the completion of the last section, between Maos and Cibatu. The journey between the two points took three days, with the actual travel time being 32? hours, because trains did not run at night, and the presence of different gauges required passengers and goods to be transferred at both Yogyakarta and Surakarta. Yet it was a great improvement over the horse-hauled carriages, which took up to two weeks for the trip. throughout Java. They have an extensive web site and you can check timetables on-line. Many busses depart from Ubung bus station for Banyuwangi the journey including the ferry at Gilimanuk takes about 4 hours. There are 2 trains a day from Banyuwang to Surabaya. The train is known as the Mutiara Timor (Pearl of the East) The day train is known as the Mutiara Timor Pagi and departs at 0900 Arr. 1536 (6hr 36 minutes. The evening train departs at 2225 Arr. 0500. 6h 35m. The trip is most interesting, first through the rural area's of Banyuwangi then into the jungle and mountains until you travel along the sea up to Surabaya. The fare is Rp30,000 (A$4). economy. Well worth seeing is Mt Bromo National Park. Simply get off the train at Probolinggo (around 1230) where you will easily find transport to the mountain. Best place to stay is Bromo Permai Hotel tel: 541021 The have simple cheap rooms to expensive with hot water. Best to take warm clothes as it gets very cold at night. Many people hike to the centre of the crater before dawn (around 4 am) to watch the sunrise. Track is visible in photo above. Surabaya is the second largest city in Indonesia and has a population of around 3 million. Currently, the Indonesian government is building a bridge between Surabaya and the island of Madura, it will be the longest bridge in the country. Madura is currently served by a frequent ferry service leaving from Surabaya's port, Tanjung Perak. (Kebun Binatang) is the first in the world to have successfully bred orang-utans in captivity. Definitely a must see. Surabaya is the location of the only synagogue in Indonesia, although it is currently inactive. In Dutch colonial times the Resident of Surabaya was Jewish. Several Jews held government posts and many engaged in commerce. Surabaya has many shopping centres a full range of hotels and some of the best Chinese restaurants in Indonesia. From Surabaya to Solo there are many trains. The economic SANCAKA at 0750-1210, Rp45,000 (A5.40) the JAYABAYA at 1430-1931, and the MUTIARA SELATAN at 1615-2131 both @ Rp80,000 (A$10.66) and the upmarket ARGO WILLIS 0655-1135, or the BIMA 1600-2050 and the TURANGGA 1819-2245 @ Rp120,000 (A$16). We recommend the SANCAKA or the ARGO WILLIS either get you into Solo for in time for lunch. Solo's real name is Surakarta, but commonly called Solo. It is set on the Solo River and has a population of over 500,000. It is a trade centre for an area producing tobacco, rice, and sugar. Manufactures include textiles, leather work, machinery, metal products, furniture, and cigarettes, but Solo is particularly noted for its batik cloth and goldwork. It is also a cultural centre, featuring gamelan music and wayang, or shadow plays. Solo's outstanding feature is the vast, walled palace of the sultan, virtually a city in itself. The European section of the city, contains a Dutch fort built in 1799, resembles an old Dutch town. 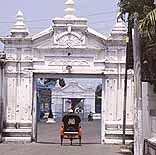 Surakarta is the seat of a private university and an extension facility of Islamic Univ. of Indonesia. Next down the line is Yogakarta. Take any of the trains listed in the previous section, plus there are some local trains as well. Yodgakarta is quite European, many colonial buildings still stand. There is a Sultan who has a magnificent palace, the Keraton, which is open to the public most mornings. Yoga as the locals call it, is one of the best places in Indonesia to shop, especially in and around Jl Malibro, also Yogakarta is the seat of Indonesia most prestigious University, Gadja Mada. which has produced many of Indonesia's intellectuals and politicians. Half an hours drive outside Yodgakarta is the famous Buddhist temple of Borobudur. in it's heyday as the Paris of Java. The old boulevard in the city is know as Jalan Braga and today features the best restaurants, cafe's and fashion shops. The Sundanese were a pastoral people farming the fertile regions of Bandung. They developed a lively theatrical tradition including the still practised Wayang Golek puppet theatre, and many musical forms. "There is a city called Bandung, comprising 25 to 30 houses," wrote Juliaen de Silva in 1614. Is the symbol of Bandung City. It was built in 1920 with art deco architecture and was the Dutch Governor's residence. It is now the office of the Governor of West Java Province. The achievements of European adventurers to try their luck in the fertile and prosperous Bandung area, led eventually to 1786 when a road was built connecting Jakarta, Bogor, Cianjur and Bandung. This flow was increased when in 1809 Louis Napoleon, the ruler of the Netherlands, ordered Governor General H.W. Daendels, to increase defences in Java against English. supposedly protected by the ancient goddess Nyi Kentring Manik. On this site he built his dalem (palace) the alun-alun (city square) and Mesjid Agung (Grand Mosque) was placed on the western side, and the public market on the east. From Bandung commuter trains run to Cicelengka via Jamal's mums home station Ranca Ekek. In the morning and evening rush-hour, the trains are so crowded people are forced to sit on top, many die every year. 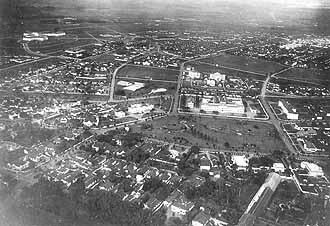 The above photo was taken from a Dutch Airforce Folker DVII aircraft The Gudung Sate building can be clearly seen top left.. In the middle of the l9th Century, South American cinchona (quinine), Assam tea, and coffee was introduced to the highlands. By the 1880's Priangan was the most prosperous plantation area of the province. (De eerste Nederlandsche Indische Spaarkas), Jl Braga, Bandung. In 1880 the rail line connecting Jakarta and Bandung. With this life changed in Bandung, hotels, cafes, shops sprouted up to serve the planters who either came down from their highland plantations or up from the capital to frolic in Bandung. The Braga became the promenade, lined with exclusive Europeans shops. The line was built in 1880 and runs through some very scenic mountain country - there are many huge bridges and tunnels, the line was an engineering feat of it's time. two trains ply the route, the first class Argo Gede 0630 & 1430 and the economic class Parahyangan which departs almost hourly. The trip takes 2½-3hrs. Trains arrive in Central Jakarta, just near the Monas monument erected by President Soekarno. 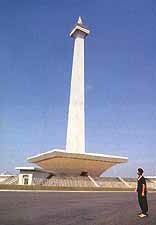 Monas stands for the people's determination to achieve freedom . The 137-meter tall marble obelisk is topped with 35 kg. of gold. remained in this vital seaport city. The Taman Fatahillah Restoration Project, begun in the early 1970s has restored one of the oldest sections of Jakarta also known as Old Batavia to approximately its original state. The old Portuguese Church and warehouse have been rehabilitated into living museums. attractions is the "Beautiful Indonesia in Miniature Park" popularly called "Taman Mini". Built to portray the variety of cultures found within the many islands contained in the Republic of Indonesia. 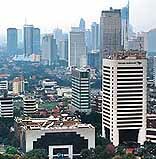 Jakarta has preserved its past and is developing for the future. Skyscrapers in the centre of the city are part of a new look. After Jakarta you have a number of choices, you could fly back to Bali, return via Semaranag to Surabaya and retrace your steps by land to Bali, or fly from Surabaya. Give it a try, you sure will have some stories to tell when you return home. Relations between the peoples of Australia & Indonesia stretch back hundreds of years to when fishermen from South Sulawesi travelled to northern Australia in search of sea cucumbers. But it was not until World War II that an Australian community was first established in Indonesia, with the arrival of the Australian troops marking the beginning of the temporary settlement of Australians. The ties, however, began during Japanese rule in the 1940s, thousands of Australian prisoners-of-war found themselves working alongside Indonesians. By the end of the war there were some 50,000 Australian soldiers in Indonesia, most of whom had been engaged in campaigns in Kalimantan and northern Maluku against the Japanese. understood Indonesians better than Europeans did, given their support for Indonesia's independence. The second pioneers of the Australian community here were the volunteers who came to share their skills in education, filling the gap left by departing Dutch teachers. information. Thousands of volunteers have come to Indonesia since. Throughout the 1950s and the first half of 1960s, Sukarno's campaign for Papua's inclusion in Indonesian territory, and the period of "confrontation" with Malaysia, slowed down official relations, also affecting people-to-people relations. Although both countries experienced ups and downs in diplomatic ties under second president Soeharto, relations in the business and social fields as well as cultural life continued to flourish after 1966, supported by Indonesia's growing economy, Thousands of professionals and business people, along with their families, started to come to live in Indonesia, mostly in Jakarta and Bali. It was estimated that after the economic crisis of 1998 around 20,000 Australians remained in Indonesia. In 1989, the Australian government established the Australia Indonesia Institute to contribute to a more broad-based and enduring relationship between the two countries. The institute has many programs, including youth exchange, fellowships and scholarships.